That is what he kept saying, "the Mother of God willed it." It was not the way we planned it. It was not the way any of us envisioned it. But it was the way the Mother of God willed it. 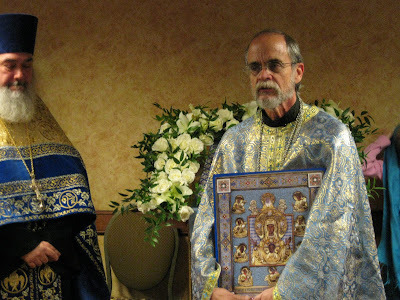 The monks accompanying the icon assured us it was the first time the Akathist to the Kursk Root Icon had been prayed in an Embassy Suites hotel. 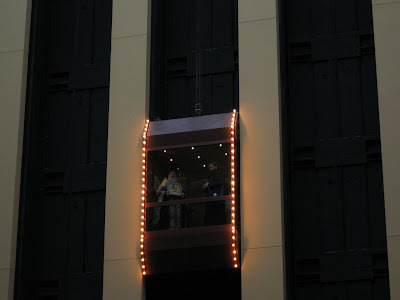 I can only imagine what was going through the mind of the family that happened to be on the elevator with them, no concept of the glorious miracle of riding an elevator with the icon that has survived over 700 years of attempts to destroy it. It can be nothing less than a miracle that these men were able to travel 15 hours through horrendous storms, sleet and ice to arrive in our city at 1:30 am. It was Her hand that guided them as they said the prayers of the Akathist while they drove, even as they passed hundreds of accidents on their journey. It was Her hand that guided hundreds of us along roads and interstates this morning, roads that were nothing but solid ice. All the beautiful food laid out at the church, the flowers and candles prepared, the place made ready to welcome Her, the roads impassable. No, it was not the way we planned it, as we all packed into a tiny conference room, the only room in the inn. No candles were here, no iconostasis, no beautiful temple to welcome her. Just a small, very hot room in the inn. The soft flicker of candles replaced by the harsh flicker of fluorescent lighting. 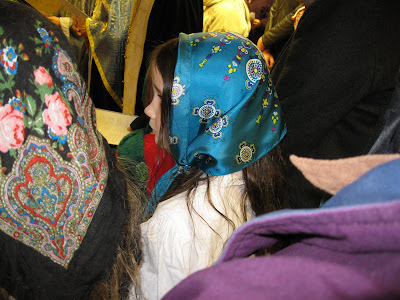 A makeshift cloth for the stand, a scarf taken from a parishioner. 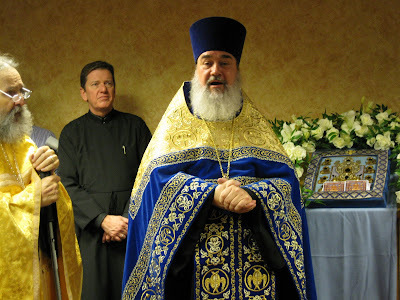 Greek, Russian, Antiochian, we were all here together, all Orthodox together. Why we all were so blessed, I do not know. So, no, it was not the way we planned it. But it WAS, and it was just as the Mother of God willed it. Beautiful! God willing, we will see it next weekend! Thank God for this! Beautiful! Lovely! I had tears in my eyes when reading about the family in the elevator. Oh the power of icons! Who knows what may happen to them in the future because of this "chance" meeting. The picture from the elevator is just amazing! 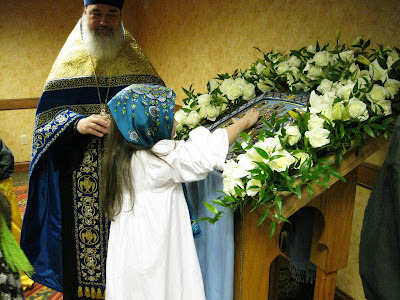 The icon was at our church last year - it was truly touching. I'm so happy to see the photos and share a little in the event. Thank God!